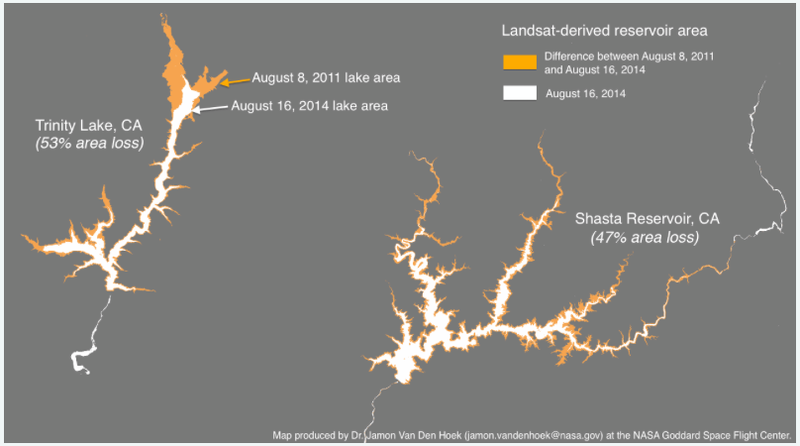 Shasta Reservoir and Trinity Lake surface area change from August 2011–August 2014. Nov 10, 2014 • The U.S. Geological Survey’s Center for Integrated Data Analytics (CIDA) has created an open source visual description of California’s ongoing drought—one of the most severe droughts on record. Landsat data were among some of the many open source data resources CIDA tapped for this presentation. Because changes in reservoir volume impact the surface area of reservoirs, Landsat imagery was used to estimate the change in surface area from August 2011 to August 2014 for two of California’s largest reservoirs: Shasta Reservoir and Trinity Lake, both located about 170 miles northwest of Sacramento, CA. The outlets of the two reservoirs are located approximately 15 miles apart. These reservoirs provide water for irrigation, hydroelectric power, and flood control.